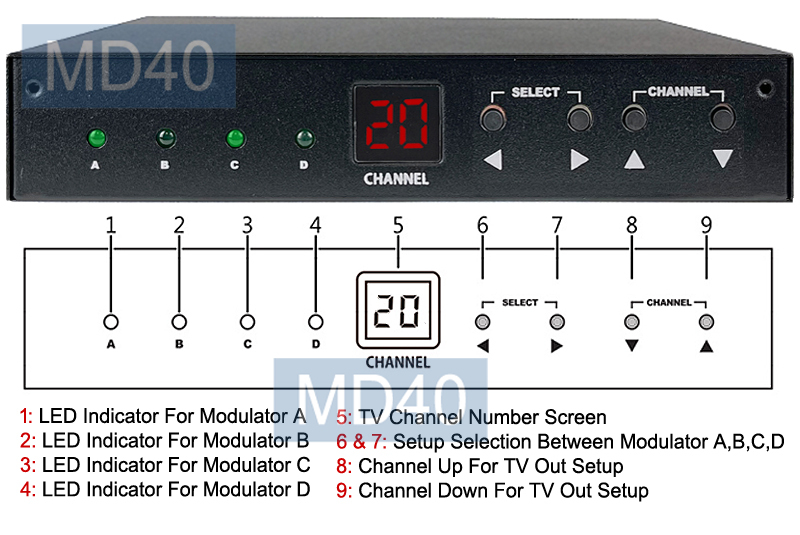 This professional RF modulator combines 4 RF modulators into one unit so it can convert and combine 4 composite RCA video/audio inputs into 4 user-defined TV channels at the same time for commercial or educational purpose. It is developed for distributing 4 live composite video signals on new or existing cable TV system through using the existing coax cable setup. Any standard composite RCA video audio feeds from devices such as satellite receivers, cable box, digital TV converter, DVD player or surveillance camera can be modulated by this device into a new private TV channel of user's choice for distribution or merged with existing analog TV system. Its programmable TV channel selection allows users to assign a desired TV channel frequency for each video input equipment. TV channel selection is controlled by push buttons on the front panel. This 4-input RF modulator allows user to create up to 4 private TV channels for school, community, church or conference room. You will just need 3 of these modulators for creating 12 private TV channels instead of purchasing 12 single-channel modulators. Great saving on money, cabling, space and power supply. After finishing the cable hookup, simply use the push buttons on the front panel to assign a desired TV output channel number for each video input device. Then users could use the TV remote to tune into the new channels just created and shall see the DVD video or camera screen showing on the TV screen. 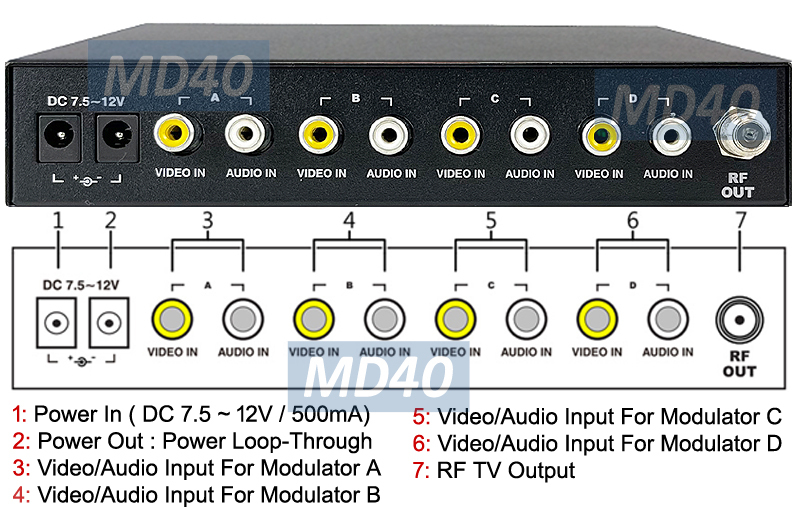 This RF modulator supports total of 4 composite RCA video inputs with 4 associated mono audio inputs. 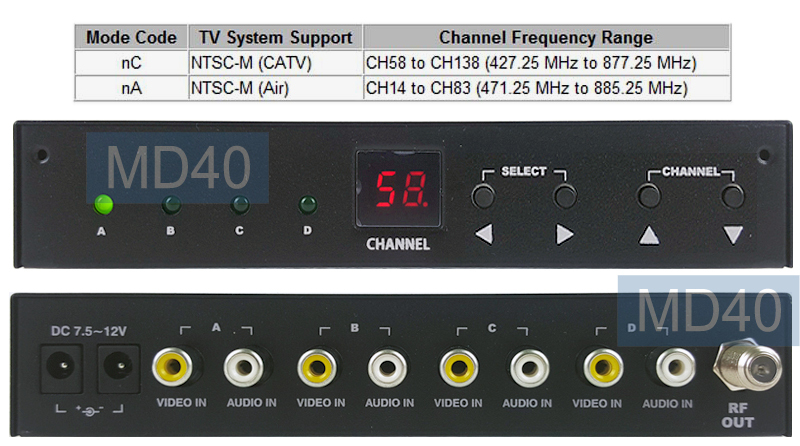 Each video/audio input can be individually configured for different RF TV channel output. 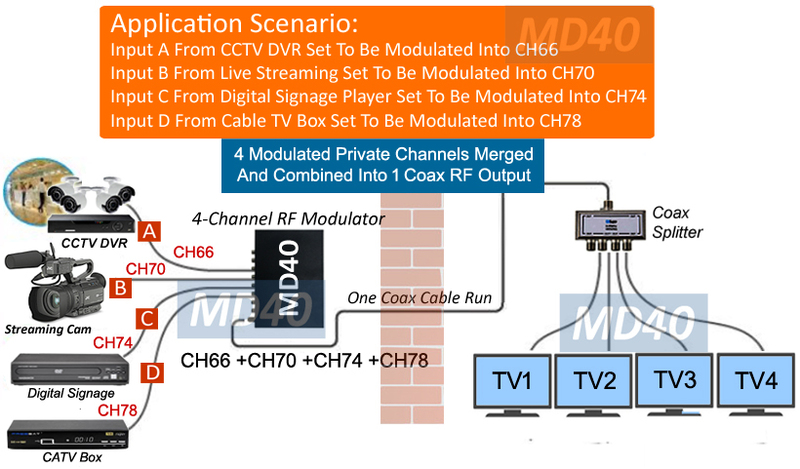 Any TV daisy chained through the same coax cable connected with the output of this 4-channel RF modulator can display the same video signals when tuned into each specific TV channel created through this device. The TV output channel assignment for each video input must skip the interval channel so the modulated video will retain the same video quality as the original source signal due to its double side band design. For example if the input A is set for using CH58, input B must skip CH59 and use CH60 or other higher channel number to avoid the interference caused by using very close channel frequency range between 2 consecutive TV channels. This video/audio modulator supports both CATV and UHF/VHF system mode with wide TV channel frequency range support. The cable TV channel range starts from CH58 to CH138 and the UHF/VHF channel range starts from CH14 to CH83. Analog video/audio signals transmitted over existing coax cable with such high dB strength can be transmitted longer distance than the typical balun or Cat5 extender solution. Multiple of these 4-input RF modulators can be combined using RF coax combined for broadcasting more A/V source signals and building up a large-scale TV distribution system for class rooms, hotels, restaurant, retail stores, hospitals. This RF modulator will memorize user's setting for modulated channel after being powered off manually or power outage event. Professional-grade audio/video to RF modulator for broadband A/V distribution for all NTSC TV system setup. Converts up to 4 composite RCA video/audio inputs to 4 user-defined CATV or UHF channels in one cable run to all TVs. Cost-saving solution for building private MATV or closed-circuit TV system. A great analog TV channel modulator for distributing up to 4 live video from SD sources such as cable box, DVD player, signage player, etc, and broadcast the modulated videos on a new or existing cable TV system through using the existing coax cable infrastructure. Supports 4 composite RCA video inputs and 4 RCA audio inputs. Easy front panel push button control for easy channel selection. Each video/audio input can be individually set up for different TV channel output. Multiple of these 4-input RF modulator units can be cascaded together to distribute more video feeds to more TVs in the same coax cable run.